A nourishing toasted breakfast served with milk or yoghurt. Can also be used in crumb crusts, biscuit or slice recipes in place of sweet breadcrumbs or oats. 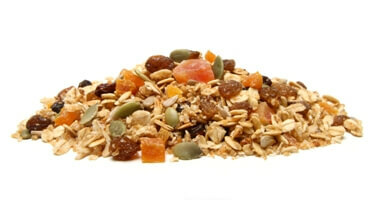 Muesli Mix (Wholegrain Oats, Raw Sugar, Honey, Wheatgerm, Malt Powder, Wheat Bran, Sunflower Oil, Sunflower Seeds, Sesame Seeds, Coconut (Coconut, Preservative (223 (contains Sulphites))), Flavour), Sultanas (Sultanas, Canola Oil), Dried Apricots (Apricots, Rice Flour, Preservative (Sulphur Dioxide)), Raisins (Raisins, Sunflower Oil), Sunflower Seeds, Dried Papaya (Papaya, Sugar, Food Acid (Citric Acid), Preservative (Sulphur Dioxide)), Pumpkin Seeds, Coconut (Coconut, Preservative (223 (contains Sulphites))). May contain pieces of nut shell or fruit pits.